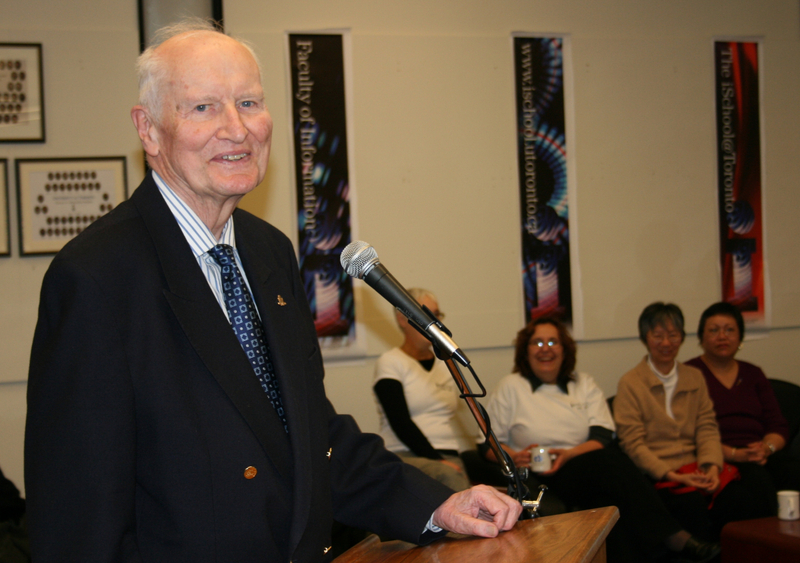 On behalf of the Faculty of Information, I am saddened to announce Professor Emeritus and our former Dean, Reginald Brian Land, passed away at age 89 on November 26, 2016, in Georgetown, Ontario. Prof. Land was a trailblazer at the Faculty, the last person to hold the Director position (1964-71), and our first Dean (1972). In 1970, Prof. Land launched the Master of Library Science (MLS) degree as the first professional degree in librarianship in Canada. A year later, he introduced the Doctor of Philosophy in Library Science degree at the Faculty. In 1974, our student, Claire England, became the first person to obtain a PhD in library science in Canada. Brian was the driving force behind our name change, in 1972, to the Faculty of Library Science (FLS), as the University upgraded our faculty status. Backed with four degrees from the University of Toronto, Prof. Land had many pursuits and played key roles in libraries and government, having held executive positions in professional associations, and as a part-time CRTC Commissioner. In 1978, he was appointed Executive Director of the Ontario Legislative Library, from which he retired in 1993. A year later, he was honoured by the Faculty, and recognized by his peers, for this dedication to the field of library studies with the FIAA Alumni Jubilee Award. Brian’s warmth, intellect, kindness, and good humour endeared him to everyone, and his legacy stands tall. He will be truly missed, as will his annual update letter he sent to us each December. You can learn more about Brian’s life and accomplishments by reading his obituary. Visitation will be at the Gilbert MacIntyre and Son Funeral Home, Hart Chapel, 1099 Gordon St., Guelph, on Thursday, December 1 from 6-8 p.m.
A Funeral Mass will be held St. Alban the Martyr Anglican Church, 537 Main Street, Glen Williams, on Friday, December 2 at 2 p.m. Brian asked that in lieu of flowers, donations can be made to the Faculty of Information Annual Fund, or to a charity of your choice, through the funeral home. Because of Brian’s support of students and love of travel – Brisbane, China, Canada’s high arctic, Prairies – we will direct donations in his memory toward the Faculty’s top profile and highest area of need: the student co-op placement at UNESCO.